The consequences of the Paris Agreement’s choice of the pre-industrial as its baseline have been discussed previously on this blog. This choice makes sense from a climate forcing perspective (as radiative forcings are measured with respect to a quasi-equilibrated state, and the well-observed recent past is not close to have finished responding to anthropogenic drivers). Looking back into the pre-industrial period, there are fewer instrumental observations of the temperature across the globe. So naturally our knowledge of the pre-industrial baseline temperature is uncertain. Just over a year ago I received an email from a colleague I had never met. 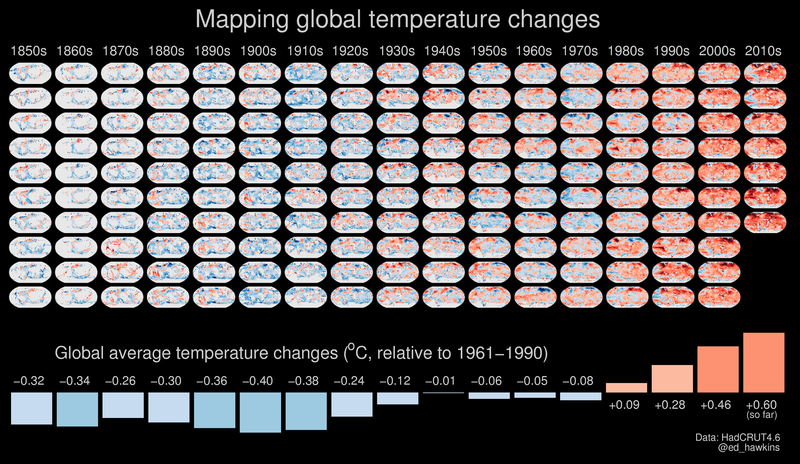 Jan Fuglestvedt asked whether I had ever made a spiral version of my global temperature graphics. He ended by suggesting that this was ‘just a (crazy) thought’. The Committee on Science, Space & Technology of the US House of Representatives conducts regular evidence hearings on various science topics. On Wednesday 29th March, there is a hearing on “Climate science: assumptions, policy implications, and the scientific method”. The following letter, summarising the scientific findings of Fyfe et al. (2016) and Karl et al. (2015), has been submitted as evidence to this hearing. The broader context is that the Committee Chairman, Mr. Lamar Smith, has previously discussed the findings of Fyfe et al. (of which I was a co-author), claiming: “A new peer-reviewed study, published in the journal Nature, confirms the halt in global warming”. This statement is incorrect, and motivated the clarification on what Fyfe et al. actually says. Scientists can’t do everything by themselves. We need to engage the millions of citizens who are passionate about knowledge to help solve scientific mysteries and improve our understanding of the world around us. There are many ways that anyone with a computer can help – volunteer to rescue old weather data or loan your computer’s CPU to simulate the climate, for example. 2016 has been quite a year for the climate. Warmest year ever recorded. Record low sea ice extents at both poles. It has also seen many amazing climate visualisations and animations. I have collected some of my favourites on this storify page, including graphics for temperature, sea ice, pressure observations and Hurricane Matthew. 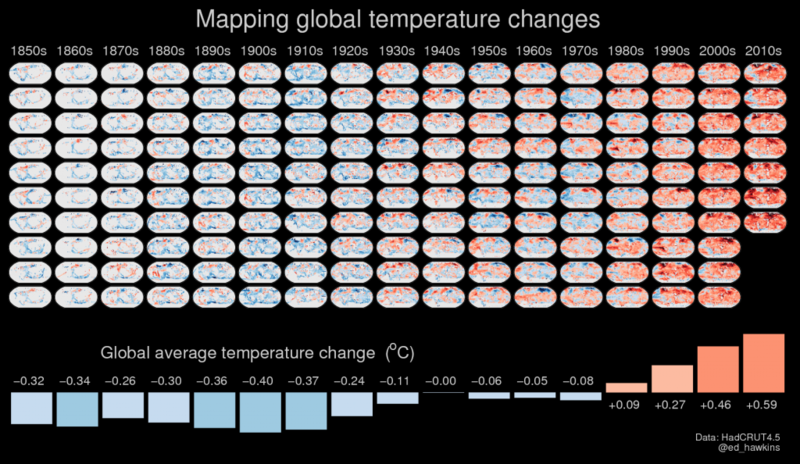 One of the graphics is shown below, mapping temperature changes from 1850-2016, and including the decadal averages of global temperatures. This graphic has been updated from a previous version. Mapping global temperature changes from 1850-2016. Click for high-resolution version. What was the last truly ‘amazing’, ‘novel’ or ‘spectacular’ science paper that you read? According to a recent bibliographic analysis the chance of encountering such ‘ground-breaking’ research has increased almost nine-fold since the 1970s.